In Xing Yi Quan the most fundamental exercise is the standing pole (Zhan Zhuang) posture of San Ti Shi 三体式 (Traditional Chinese: 三體式). 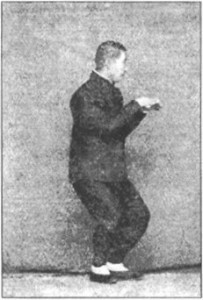 It consists of moving between 3 stances, the Wu Ji stance, The Tai Ji stance and the San Cai Stance where typically the third stance is held for an extensive period. The purpose of this practise is to develop root and whole body power. Root it partly a matter of developing balance, stability and leg strength but also a matter of relaxing and sinking so to the extent where you can be almost unmovable while at the same time agile in a natural and effortless way. Whole body power (Zheng Ti Jin) is developed by unifying heart, intent, Qi and force and aligning the body to be able to move as one coherent and unified unit by aligning feet and hands, elbows and knees, and shoulders and hips (these alignments are known as the six harmonies or Liu He). As you progress you will find many more connections between different parts of the body as well as between the “inner” qualities (heart, intent, qi and force) and the “outer” physical body. When standing you need to find a balance between active curiosity and investigation, cultivating intention and relaxed openness. The idea is to relax as much as possible but not to be slacking while at the same time have power but without any tensing or hard efforting. This is similar to how a tiger relaxes when preparing to leap for its prey i.e. it is very alert and its power is all there to be released in an instant but neither tensing in any way nor dozing off or slacking. How are things connected together? How does one thing affect another? Is the posture whole without hollows and protuberances? What is the experience of standing like this? Standing like this you pay attention to physical sensations, feelings and moods, thoughts and longings etc. in order to understand oneself, where you are and how things work. Cultivating intention means to hold certain images or ideas that will develop gong fu (refined skill). Let’s take the quality of rootedness as an example. By focusing on stability and rootedness while standing I help to develop it faster. I can also add mental images to enhance this development e.g. I imagine that my legs are tree trunks and that there are roots going out from my feet into the ground. Relaxed openness means to allow things to develop naturally, to give up myself and just stand there open to and accepting of whatever happens. This balances cultivating intention so that practise just does not turn into artificial effort and allows the posture to start speaking to you. There are two kinds of practice of San Ti – a static practice and a dynamic one. The dynamic one is basically moving back and forth between contracting and expanding from left side to right side while standing for a short time (10 breaths or so) in each posture whereas the static practice means to stand for much longer time in the San Ti posture. Sun Jian Yun recommended an hour of San Ti every day but said that her father would sometimes stand for 4-5 hours without a break. When practising San Ti, you transition between 4 postures i.e. Wuji (Non-polarity) is the state you are in before commencing practice, without thoughts or ideas, without form or shape, without a sense of “me” or “him”. In the mind, all is without distinction, without intention and nothing being thought about… In the starting position, begin by facing straight, your hands hanging down, your feet positioned at a ninety-degree angle. This posture goes along with the natural way of heaven and earth. In order for us to be able to find natural, effortless movement we need to reconnect with emptiness and stillness. This is the idea and meaning of the Wuji stance. “Natural” means the opposite of artificial, false and acquired i.e. inherent and true. Before we start to direct our intention and create something we need to return to our original self, otherwise our actions will be filled with the obscurities of the everyday mind. The emptiness stance is like the “just sitting” of Zen returning to our original face before our parents were born. Sun Lu Tang speaks of this returning as Ni Yun (逆運) whereby turning the mechanism of Qi in post heaven (i.e. the manifested) one can return to pre-heaven (the non-manifested) and from there returning to the original source (復出歸元). The gate to enter stillness (入靜, ru jing) lays in not doing (无为, wu wei) anything about what is experienced. The practice of not doing is learning to give up (舍, she). Most importantly it is giving up wanting things to be different. The practice of giving up is to neither drop nor resist (不丢不顶, bu diu bu ding). It is not just standing there like a moron, it is completely alert as if the hair was on fire, vitally interested in what is going on and at the same time completely without unnecessary tension and striving. Here opens the gate to true stillness. In the vital aliveness of spacious awareness where right action (正業, zheng ye) or the action of no action (无为之为, wu wei zhi wei) spontaneously (自然, ziran) arises. In practical terms you assume the Wu Ji stance and then relax and let go. There are probably some thoughts and tensions in the bodymind. When you notice those, let them go and return to the experience of just standing in Wu Ji. It is not suppressing thoughts or tensions but rather a letting go and a return to the state before thought and tension arises similar to the Chan practice of Hua Tou. It is not becoming dull but on the contrary a very vibrant alertness that at the same time is without tension or effort. After practising like this for some time, you will start to get glimpses of stillness. Gradually these glimpses will be longer and eventually the experience of stillness will be the prevalent experience. Once you start to become familiar with the experience of this stillness you can enter it directly by just directing your intention towards it. 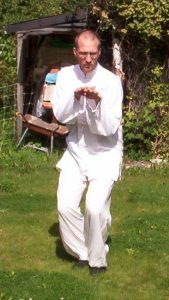 Entering stillness is the fundament not only for internal martial arts but of Qi Gong, Daoist practise, and Buddhist meditation. From the starting position, turn halfway to the right, hands hanging down, left foot in front and closing toward your right ankle until your feet are now making a forty-five degree angle. Inside, your tongue touches your upper palate and your perineum is lifted. 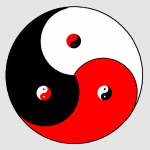 This posture is about grasping the passive and active aspects and getting them to switch, reversing Qian and Kun, turning the energies and thus reverting to the innate true active energy in place of the acquired fake active energy that is so harmful to us. True active energy is that which truly our own and is an expression of our true self. Fake active energy is that which is artificial, the result of “trying” and efforting. 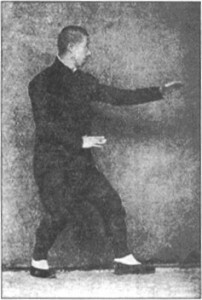 In practical terms you need to find a way to move the foot without effort, so pay close attention to the transition from no-movement in the Wu Ji stance to the effortless movement of the One Qi stance. One important key in making this work is to really find Wu Ji. If you find yourself exerting effort then you need to go deeper into Wu Ji and the connection to manifesting the single qi through alignment with the mind, intent and body. The manifestation, i.e. movement of the foot, connecting Ren channel and Du channel through touching the upper palette with your tongue and lifting the perineum and the reverse circulation of energy is all happening as one movement and as an expression of the intent. It is not like “first imagining it and then do it” but more like “intending it is doing it” or “the intention of doing it and the physical action are two sides of the same coin”. The front foot is empty but with a spark of fullness in it. This is accomplished by keeping the foot very lightly on the ground. If you imagine that there was an ant under your foot, it would not be able to move but it would not be crushed either. The body method in the starting position goes from stillness to motion. You must not lean forward or back, or incline to the left or right. You should be balanced and not drift away from balance, standing centred and not leaning away. Your left foot is in front, your right foot behind. Your left heel is close to your right ankle, making a forty-five degree angle, as in the photo. Your shoulders loosen and have an energy of hanging down. Your elbows are close to your ribs. Your hands cover your heart, left hand below, right hand on top. Your left forefinger extends forward underneath and your right middle finger extends forward on top, covering your left forefinger, the two fingers coming together. Your head should be pressing up and your neck should be upright. Your waist have an energy of sinking down. Your hips have an energy of drawing in. Your heels have an energy of twisting outward. Your legs slowly bend downward, as in the photo. The bending of your legs should have a rounded fullness, and must not be a dead bend. Your body still must not have the slightest bit of crookedness, and there must not be the slightest bit of effort in your mind. During this starting position, your intention is to be like a vertical pole that has been placed in level ground. Once this pole starts to stand stably, your mind and energy become naturally calm and still, without inclining toward anything. It is said the mind unites with the intention, the intention unites with the energy, and the energy unites with the power. These are called the “three internal unions”. If your mind is not uniting with your intention, then being off by a hair will make you miss by a thousand miles. Therefore, if you want to learn this art, you have to delve deeply. Rooster leg: to differentiate the weight and to stand firmly, grasping the ground. This ability means the inner quality of integrity and independence. Dragon body: The body is folded into sections yet at the same time all united as one. Nothing is stiff but free like a dragon floating in the sky. This ability means the inner quality of adaptation and change while maintaining power and integrity. Bear shoulders: The neck is straight and has vertical power (bai hui i.e. top of the head is pressing up). Shoulders relax down so that Qi sinks to Dan Tian. Back is rounded and chest relaxed. This means the inner quality of stability and groundedness. Tiger embracing head: It is like a cat catching its pray i.e. alert and yet relaxed. It is also like a tiger exiting its cave (ferocious and fearless) where the contraction is manifested as the hands embracing each other. This means the inner quality of relaxed awareness. Eagle claw: The eagle catches its prey with great power in its claws but without strenuous effort. The strength of the grip is from the Dan Tian. This means the inner quality of focus as a natural way of being (rather than exhausting concentration). Although the back is not leaning or bending, power is gathered there. This is achieved by sinking the tailbone and filling the gate of life (ming men) while suspending the head top (bai hui). When we talk about using the power of the five bows, the arms and the legs store power by bending but the back stores power by straightening. However the arms and legs are not overly bent adhering to the principle of “looks bent but is not bent” (似曲非曲). 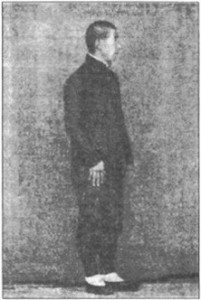 Originally, when Sun Lu Tang learned it, this was practised by moving the hands straight up into position but he later modified it to be done as follows: The posture begins with expanding and ends with contracting. In the expanding phase, both arms move out and away from the body until the arms are level with the ground. From there the knees start to bend while the arms move towards the heart. This movement of the arms is reminiscent of a tiger leaving it cave. It ends up in a posture reminiscent of a tiger holding the head of its pray, hence the alternative name. 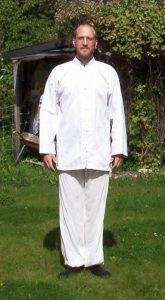 This posture can be practised by itself, alternating between the one qi stance and the taiji stance. To shift sides, go back to wu ji stance and from there, move into the one qi stance on the opposite side. 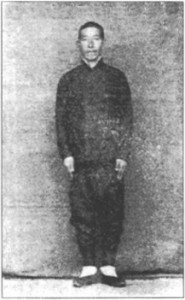 After travelling to Shanxi and meeting Song Shi Rong and Che Yi Zhai who both had the front palm more vertical, Sun Lu Tang modified the San Ti stance that he had learned from Li Kui Yuan and Guo Yun Shen as he discovered that this way of practising was greatly conductive to developing internal energy. When going through your practice, the myriad techniques all come out of the San Ti [three-substance] posture. This posture is the gateway to the method, the main tool in Xingyi Boxing. The index finger and He Gu (acupoint located on the highest spot of the muscle when the thumb and index fingers are brought close together) of the upper hand aligns with the centre line. The tip of the index finger of the front hand is at the level of the lips. The base of the thumb is on the lower side of the navel. The body is slightly turned but only slightly. The weight is about 60%-70% on the back leg. The top of the head suspends upwards, the perineum lifts gently, the tip of the tongue rest against the upper palette. The breath sinks to the lower abdomen, the shoulders and elbows sink down, and the coccyx sinks down. Breathe naturally do not force or hold your breath. Shoulders and elbows should sink down with intent but not in a forced way. The coccyx sinks or drops down so that the “gate of life” (ming men) fills but do not tuck in the buttocks in a forced way to try to accomplish this. Done properly this will protect the back and give it strength. You can test this by pushing against a tree or wall. If the force is evenly distributed throughout the back then you are doing it correctly. If otherwise, you will feel that the force concentrates in a certain area of the spine. The lower side of each arm pushes forward and the upper side of each arm pulls back. Hence, the extending withdrawing movement balance each other so dynamic stillness is achieved. Legs expand outwards on the inside (crotch rounded, heels press outward) and inward on the outside (hips move inward, knees press inward, toes press inward). Hence the inward contracting and outward expanding movement balance each other resulting in stable unmovingness. Knees are aligned with the feet i.e. each knee is not twisted away at an angle compared to the foot), hand is aligned with the arm i.e. the hand extends straight out from the arm and is not in an angle to the side compared to the arm. 1. One the back leg, the hip joint and lao gong (middle of the foot) are one vertical. This corresponds to the heel and buttocks being on a vertical. 2. The front knee and the heel form the second vertical. 3. The tip of the toes and the wrist form the third vertical. The “three substances” are the representations of the three materials of heaven, earth, and mankind. Within the boxing art, they are the head, hands, and feet. The three substances also each separate into three sections. The waist is a root section (outwardly the waist, inwardly the dan tian (elixir field)). The spine is a middle section (outwardly the spine, inwardly the chest). The head is a twig section (outwardly the head, inwardly the Ni Wan area [upper dan tian]). The shoulder is a root section. The elbow is a middle section. The hand is a twig section. The hip is a root section. The knee is a middle section. The foot is a twig section. Each of the three sections has three sections within it. The idea of manifesting heaven earth and man in the body follows the alchemical principle of “as above so below, as below so above” and opens up a very interesting line of investigation. When you stand in San Ti you probably do not have the feeling that your head corresponds to heaven in a meaningful way and yet this is how grandmaster Sun Lu Tang describes it. Investigating this is quite similar to working with Gong An (Koan) in Chan (Zen) i.e. on the one hand you have great faith that there is really some truth to this and on the other hand great doubt that this is really something that can be directly experienced. In the meeting of this great doubt and great faith there is something that you will start to discover if you inquire deeply with sincerity, openness and curiosity. By discerning root, balance point and twig it becomes possible to use the lever principle. When you combine several levers in a movement tremendous power can be generated with very little effort. This principle thus merges with the Luo River Document’s count of nine. The Elixir Book says: “The Way: from emptiness arises a single energy, then from the single energy yin and yang is generated, yin and yang then combine to make san cai (the three substances), and then from the three substances all things are born and raised.” This is the idea. And so it is said that nothingness and the one qi (oneness) are the root of heaven and earth, the ancestor of the passive and active, the progenitor of all things, the “golden elixir”. It is also the internal power within Xingyi Boxing. In the meeting of yin and yang you have a third. Although this is similar to Fichtes “thesis, anti-thesis, synthesis”, it goes much deeper than that. Sometimes the third is found in between the opposites, something it transcends them, sometimes it is the result of a merging of the two. Qi in this regard can be seen as a relational concept i.e. that which flows when there is dialogue. From this we can say that the internal power in Xing Yi comes from the dialogue between oppositions or paradoxes. We need to discern the opposition clearly but not keep them isolated from each other. From a practical point of view you should investigate how you can move in any direction from the San Ti posture and hence practically manifest the idea of “San Cai gives birth to the ten thousand things”. This is also why all forms in Xing Yi starts with San Ti (technically there is a “lower hand San Ti” that we start some forms with e.g. Ba Shi Chui but that is a variation and not a breach of this principle). This is a more dynamic way of practising San Ti where each posture is held for a shorter time. Typically, you spend 6 breaths in Wu Ji, 12 breaths in Hu Bao Tou and 24 breaths in San Ti then back to Hu Bao Tou for 12 breaths and then return to Wu Ji. Continue this way passing through the postures for as long as you decided. The basic mental attitude in San Ti is Hu Bao Tou (虎抱头, Tiger embracing head). It is relaxed and yet alert like a big cat hunting for prey. You are completely aware of what is embraced (the whole body) yet at the same time vibrantly alert and aware of surroundings. With regards to Yinian Huodong (visualizations), you start with imagining or focusing on a certain aspect or principle, then once it is established you allow for more and more curiosity and investigation. This makes for a transition from “making it happen” to “discovering that this is so”. If you experience distractions and random thoughts then focus on your interest in what is going on and what you are trying to cultivate. It begins with curiosity which then turns into interest. When there is wholehearted interest, random thoughts simply does not arise. You can progress your practise slowly. First you need to be able to stand correctly so focus is just on correct posture. Then focus on a principle and start investigating. E.g. Relaxing here does not mean slacking or any kind of dozing off relaxation but rather a kind of relaxation that is open and receptive and that does not hinder you from expressing force. It is similar to the way a big cat relaxes when preparing to attack its prey. Liu mian ba fang is an expression in Chinese that means 6 sides (up, down, left, right, forward, back) and 8 directions (south, north, east, west and the 4 in between) i.e. in all directions. This is how we should think about the power in Xing Yi. It should be up, down, left, right, forward and backward at the same time. This must not be in a tensed way but rather as true potential simultaneously manifested. Whole body power (Zhengti jin) is sometimes called Hun Yuan Li and is the same thing as the 6 harmonies. It means the whole system is engaged in the action (of standing in this case) i.e. we do not stand and think about something else or try to stand e.g. by resisting the pain in the legs. Better in that case to take a break and then stand again. This way you slowly and gradually increase the time you can stand. If you try to force it too much, bad habits tend to develop. Root is vital for stability and the ability to direct force to and from the ground. One aspect of developing root is understanding, and learning to control, your centre of gravity. A great help in making progress faster is to have a friend push and pull you gently on various parts of the body. You should not resist by purposefully moving in the opposite direction but rather redirect the force down into the ground. In order to really be able to manifest whole body power you need investigate opposing forces. The legs are simultaneously expanding outwards and contracting inwards and hence remain in a dynamic stillness. The hand is pushing forward from the underside and pulling back from the upper side etc. Focus on one opposing aspect at a time, and then integrate it with the other ones and so forth until you have a clear understand of opposing forces in all directions. When emitting force you will then experience it as a relaxing discharge rather than a strenuous build up of directed force in a direction. This is something you practise in Pi Quan which is practised as moving from San Ti on one side to San Ti on the other side so will not be further elaborated on here. The five bows are the two legs, the two arms and the back. When issuing force, all bows collaborate in a coordinated manner, coordinated by the dan tian, to mobilize the entire body. The firmer the bow is, the more power it can hold until you reach the point where it is too rigid when no power can be generated. This is especially true for the back which looses power if it is bent in an exaggerated way. The three dantian (lower belly, solar plexus, middle of the head) align vertically. The 3 dan tian are like “Qi hearts” in the body. They are connected with the flow of Qi e.g. in Ren channel and Du Channel. The lower dantian is connected to the transformation of essence to qi and is the source of intuition and the development of manifested/obvious power (Ming jin). The middle dan tian is connected to the transformation of qi into spirit and is the source of the true mind and the development of hidden power (An jin). The upper dan tian is connected to the reconnection of the spirit with the great void and is the source of intent and the development of transforming power (Hua jin). Although this might seem esoteric when starting, the point is that when you are ready to transition from the first accomplishment of obvious power to cultivate hidden power, you return to San Ti standing to find the true source of the power before working on manifesting it in the five elements and twelve animals. The six gates are the top of the head (bai hui), the perineum (hui yin), the centre of the palms (lao gong), and the centre of the soles (yong quan). The top of the head and perineum lifts up. Centre of the soles and hands empties up/inwards. The three flows are: The flow of qi from up to down (heavenly qi or tian qi). The flow of qi from down to up (earth qi or di qi). The circulating qi of man as expressed in the small and large heavenly circulations. Keep a dynamic balance between engagement and allowing things to happen, cultivation and natural growth. Do not tense or slack off but find the middle path between the two where you can be vigorous, alert and natural. Do not resist but find a way to work together with whatever you are resisting instead. Do not try, just do it whole heartedly. Do not overdo practice but do not refrain from practising diligently – find the level of practise that keeps you constantly evolving and growing. If you have a good friend or training partner he/she can help you improve more rapidly by gently pushing and pulling your body in all directions. You should find a way to handle the push or pull by redirecting the force into the ground. You should also make sure that you do not have to tense a certain area of the body to compensate for the force. If you do, it is a sign that your understanding of whole body needs further refinement. The push or pull should be at all areas of the body e.g. the left leg, back of the head, right arm, elbow, hip etc. so that you have the chance to get feed-back from all angles. I would recommend that you do some warm up exercises before starting to practise standing. This could be taking a brisk walk for 10 minutes followed by some gentle dao yin or some gentle loosening exercises and a few minutes of jump rope or running. In the beginning do not stand too long; a few minutes on each side and a total of 10 – 15 minutes is good. As your body awareness and skill increases, gradually increase the time you stand to about half an hour or so. I would not recommend standing longer than that regularly until you have had a competent practitioner correct your posture hands on. Support this site and the development of online courses!